ROUND ROCK, Texas - The Round Rock Express (5-3) used a four-run eighth inning to propel themselves to a comeback win over the Nashville Sounds (2-6) in their series final on Thursday night at Dell Diamond. SS Myles Straw went 2-for-3 with a double and triple in the victory. Express RHP Akeem Bostick (1-0, 3.86) earned the win after pitching four innings of relief with two hits, zero runs, and three punchouts. On the losing end, Nashville LHP CD Pelham (0-1, 13.50) surrendered four runs on two hits and one walk in 0.1 innings of relief. Straw got the ball rolling for the E-Train when he hit a hard line drive into left field for a leadoff triple to open the bottom of the first inning. CF Derek Fisher followed with an RBI single to put Round Rock ahead by one. Nashville would answer back with five runs in the top of the second to take an early lead. 1B Matt Davidson and 2B Danny Santana got on base after back-to-back walks before former Express and current Sounds 2B Andy Ibanez singled on a ground ball to advance Davidson and Santana into scoring position. Shortly after, Nashville C Jose Trevino lined into a force out that allowed Davidson to score, while Ibanez moved to second. DH Adam Moore built off the Sounds' momentum, hitting a two-run RBI into center field. CF Carlos Tocci capped off the Sounds' busy inning with a two-run homer that made the score 5-1. In the top of the third, LF Willie Calhoun sent a line drive into left field to get on base, eventually scoring on a Santana double. The E-Train bats ignited in the bottom half of the third to continue the back-and-forth affair. C Jamie Ritchie blasted a double into the outfield, followed by an Alex De Goti single. Next up, Straw fired an RBI double into center field to score the catcher and position De Goti to add another run on a Fisher ground out. 3B Jack Mayfield added a double to put the E-Train within 6-4, a score that would remain until the bottom of the eighth inning. To kick off the eighth, Sounds LHP Zac Curtis was replaced by Pelham, who later struck Straw with a pitch. The infielder used his speed to steal second and third base, then race home on a Mayfield single, bringing the Express within one. The E-Train hopped back into the driver's seat when RF Kyle Tucker stepped up to bat after a walk put LF Yordan Alvarez on first. 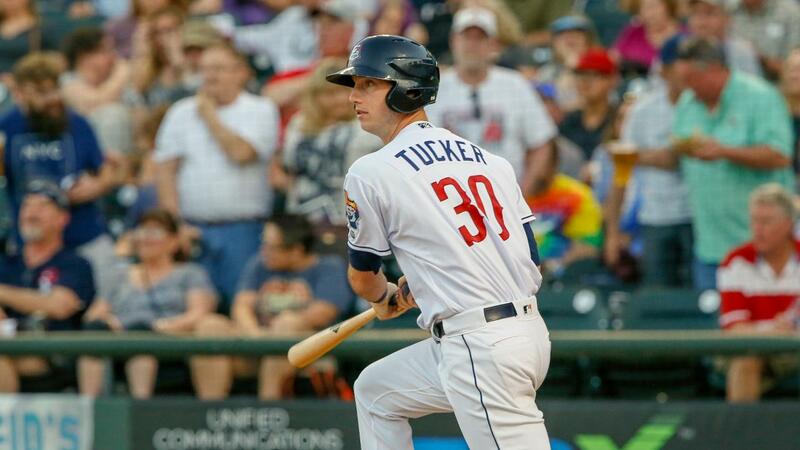 Tucker launched the ball into right field, allowing Mayfield to score and tie the game at 6. 1B Taylor Jones pushed Round Rock over the Sounds with a two-run RBI to make it an 8-6 ballgame. The E-Train defense held down the fort in the ninth to secure the victory. Round Rock begins a four-game series against the Memphis Redbirds (St. Louis Cardinals affiliate) on Friday night. Express RHP Corbin Martin (0-1, 4.15) is slated to face Redbirds RHP Daniel Ponce de Leon (1-0, 3.60). First pitch at Dell Diamond is scheduled for 7:05 p.m.